At the Classic Farm our butchers Ben Le Main and Colin Falle prepare our beef and pork from our own livestock. Our beef herd is an Aberdeen Angus cross – the Aberdeen adds body and taste and produces very impressive beef. 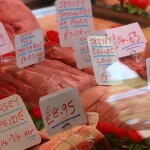 Our pork is from our own pig herd, the largest in Jersey, of around 30 breeding sows, naturally farmed and GM free. In 2013 we are introducing a new beef herd of Jersey crossed with Belgian Blue. 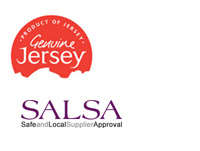 We are very proud to supply most of Jersey’s top restaurants with meat and dairy products from the farm: The Grand Hotel, The Atlantic Hotel, Mark Jordan at the Beach, Jersey Potteries, Sumas Restaurant, and many others. We always have a selection of freshly prepared meat available at the butcher counter but please feel free to phone and order any particular joints or cuts of meat you require. Phone and ask the butcher to prepare your order.